A century has passed since the participation of the United States in the First World War in 1917-1918, and of course West Virginians volunteered, like so many other Americans, after declaration of war on April 6, 1917. 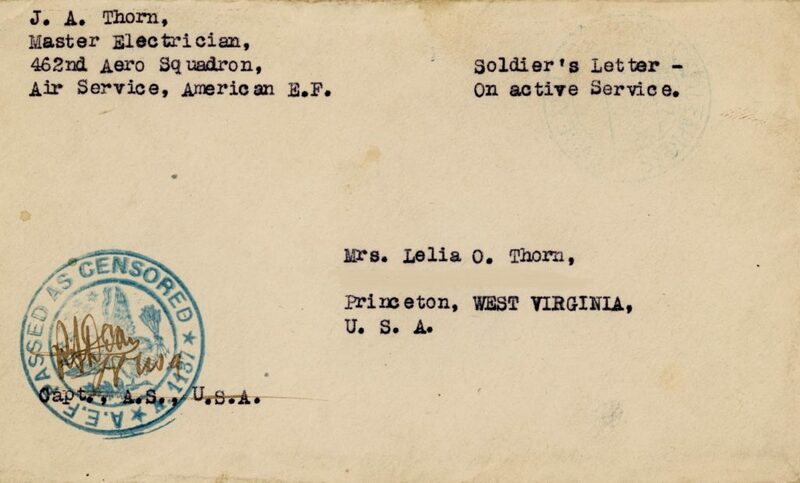 A recent acquisition of the History Center, including letters and photographs, details the war odyssey of West Virginian John Thorn of the 462nd Aero Squadron. There were numerous squadrons in the Air Service of the United States Army, and in addition to combat, they also performed duties of training, ground support, and construction. The 462nd was a construction squadron in which John Thorn served as a master electrician. 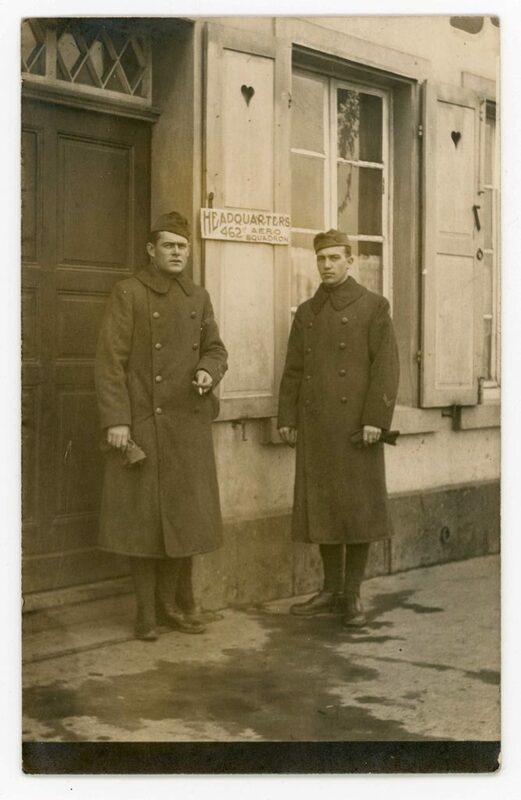 The letters in the recently acquired John Thorn collection, A&M 4254, show him training in Texas in August of 1917, traveling through England in October, and finally serving in France in the month of November to build barracks, shops, and hangars at the Third Aviation Instruction Center. Located in Issoudun, the Center was the largest airbase in the world at that time, encompassing 50 square miles of multiple airfields and facilities. United States airmen were trained here prior to their deployment for aerial combat on the Western Front, including fighter pilots like Eddie Rickenbacker, Frank Luke, and others. Wing and Body Room of minor repair department, Instruction Camp, Aviation Field No. 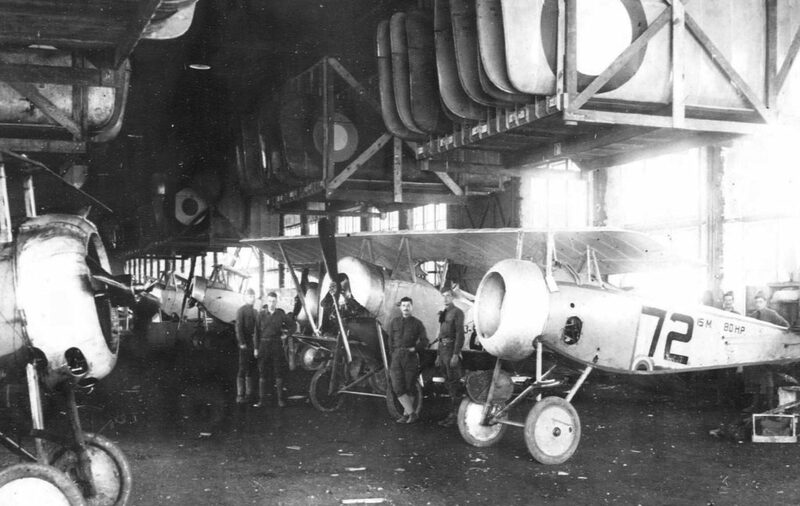 3, 3rd Air Instructional Center, Issoudun Aerodrome, France, May 21st, 1918. The 462nd construction squadron could have erected these facilities. Thorn’s letters during the war were censored so they mention little regarding the conflict and the specific activities of his unit at the Center and elsewhere. Censorship immediately after the war, however, was apparently less severe as evidenced by the content of the letters. 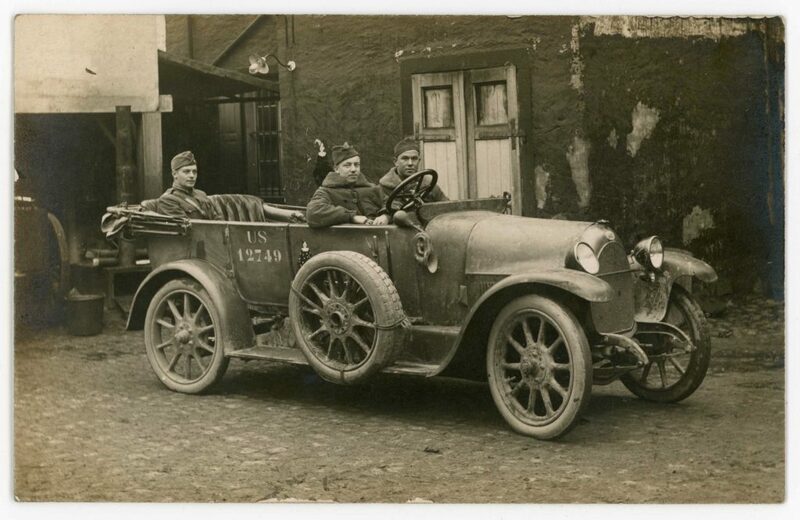 And since surviving photographs in the collection mostly or entirely document the post-war era, this blog will focus on his experiences during allied occupation of the Rhineland after the armistice. After the war the 462nd was initially assigned to occupy the city of Trier on the Moselle River, but soon moved to Koblenz in the American occupation zone. 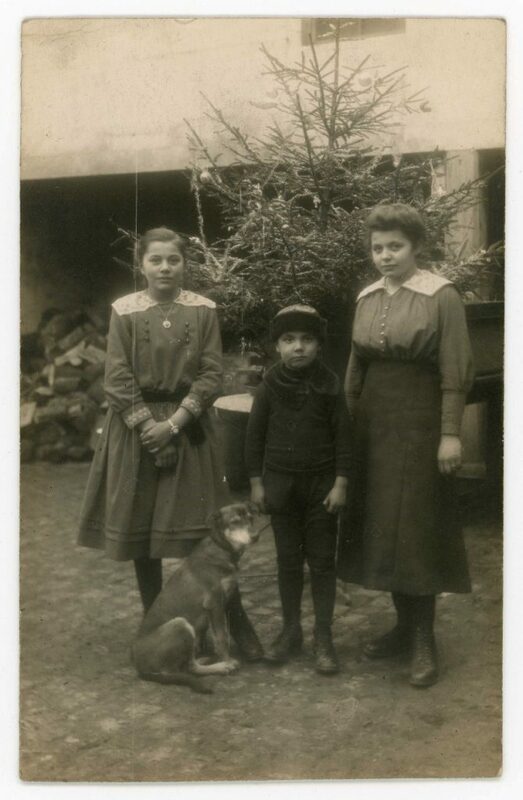 “Treves [Trier], Germany — Dec. 25/18 — Three children of the old man who owns the building in which our office & hqrs. are located”. In this photograph, John Thorn is on the right. 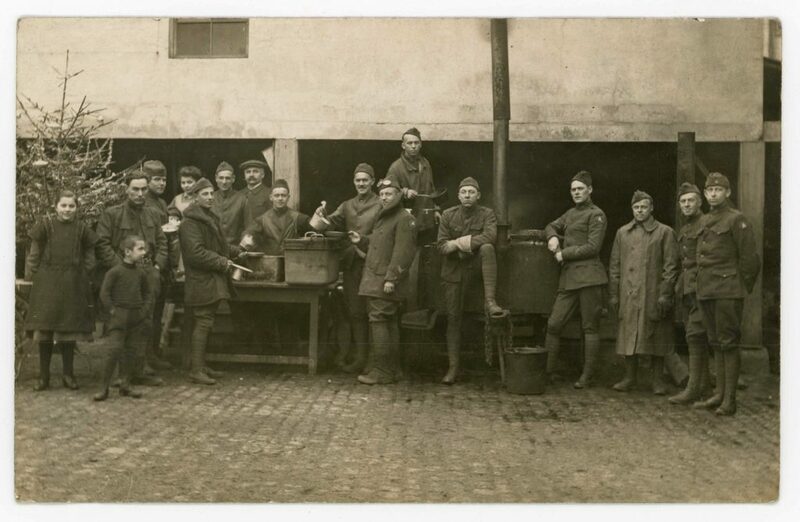 “Treves — Germany — Taken in front of our Hqrs., just before starting to the city, Dec. 30/18 — The other fellow is our Top Sergeant”. “Capt. Cobb, our commanding officer, his chauffeur and one of his assistants. 4. 462nd Aero Construction Squadron, during the advance of our troops in the St. Mihiel and Argonne-Meuse offensives, constructed five airdromes on the retaken territory with such alacrity as to enable our flying squadrons to carry on operations without delay. 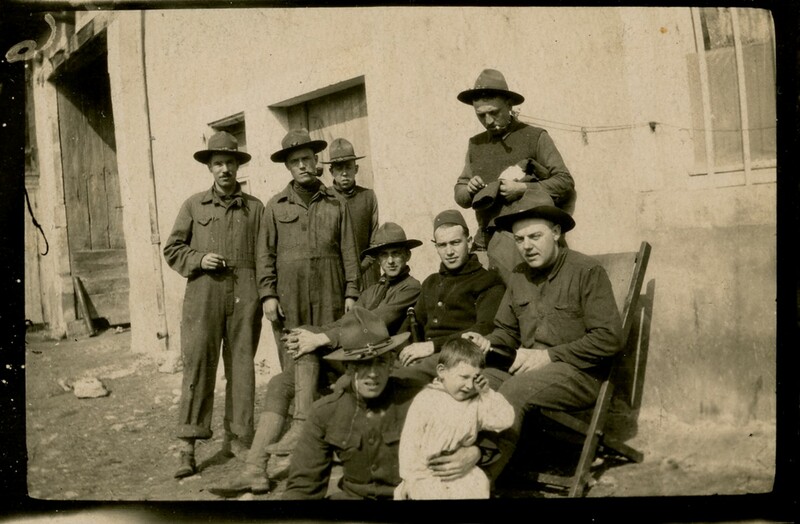 “Some of our comrades in front of a French billet [with] our ‘adopted’ orphan. John Thorn is wearing a brimless hat, undated.